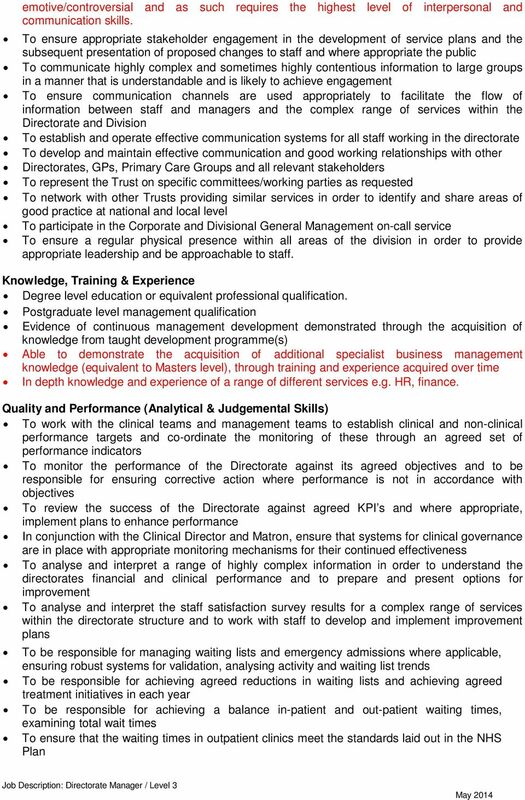 Download "JOB DESCRIPTION: DIRECTORATE MANAGER LEVEL 3. 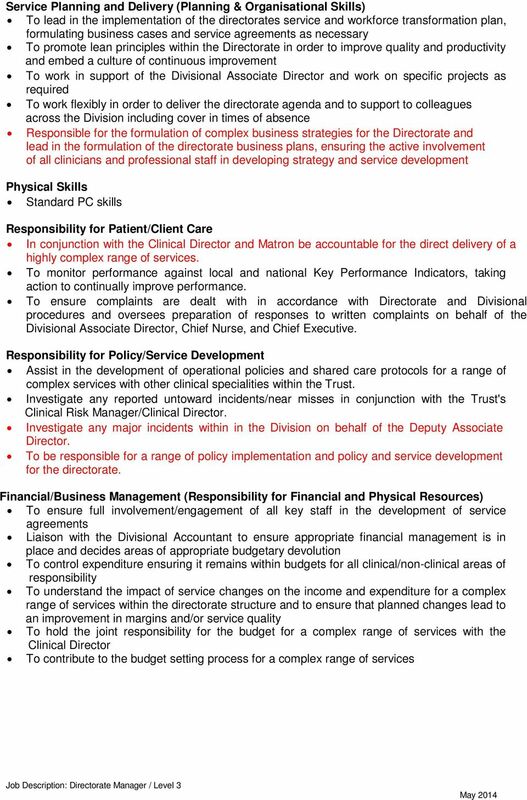 Job Description"
4 Responsible for the procurement of all physical assets for a department/service Human Resource Management (Responsibility for Human Resources) To be responsible for the day to day management of all non-clinical staff within the Directorate including recruitment selection and retention, deployment, training and disciplinary matters. To support the Matron in the day to day management of all nursing staff within the Directorate, including induction, absence management, communication etc. To support the Clinical Director in the day to day management of all medical staff within the Directorate, including induction, absence management, communication etc To ensure that effective systems of performance review and objective setting are in place and in conjunction with the matron ensure appraisals are carried out for all staff, identifying individual development and training needs To ensure a directorate workforce planning process is in place and work with the Matron and Clinical Director to produce and implement a robust workforce plan taking account of relevant legislation and professional guidelines e.g. EWTD. To produce a learning and development plan as part of the workforce planning process To ensure compliance with Health & Safety legislation and regulations and Health & Safety policies and procedures within the Directorate To work with the Clinical Director and management team to ensure that time and resources are managed through effective teamwork, leadership and motivation within the Directorate To ensure that at all times, staffing rotas reflect the needs of the clinical areas and that the skill mix is best used to enhance patient care whilst complying with legislation. Responsibility for Information Resources To ensure systems are in place for the collection and analysis of patient activity data and related financial information To ensure there are mechanisms in place for ensuring the accuracy and validity of this information To regularly write reports for formal committees and boards. Responsibility for Research & Development To regularly undertake surveys or audits as necessary to own work/regularly undertake research and development activity. 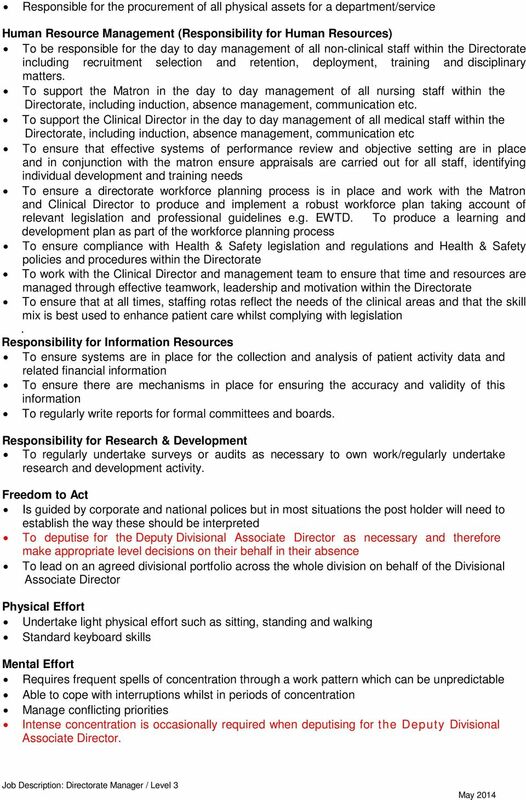 Freedom to Act Is guided by corporate and national polices but in most situations the post holder will need to establish the way these should be interpreted To deputise for the Deputy Divisional Associate Director as necessary and therefore make appropriate level decisions on their behalf in their absence To lead on an agreed divisional portfolio across the whole division on behalf of the Divisional Associate Director Physical Effort Undertake light physical effort such as sitting, standing and walking Standard keyboard skills Mental Effort Requires frequent spells of concentration through a work pattern which can be unpredictable Able to cope with interruptions whilst in periods of concentration Manage conflicting priorities Intense concentration is occasionally required when deputising for the Deputy Divisional Associate Director. 5 Emotional Effort Develop communication methods to help reduce barriers to change, using appropriate language to engage with staff in a positive manner Regularly dealing with patient complaints and staff problems. Frequently dealing with distressing or emotional circumstances. Working Conditions Working in a variety of areas across the hospital site Regular VDU usage Personal/Professional Development To take every reasonable opportunity to maintain and improve your professional knowledge and competence To participate in personal objective setting and review, including the creation of a personal development plan Standards of Behaviour The principles of Improving Working Lives must be upheld at all times To comply with Standards of Business Conduct Health and Safety To take reasonable care for your own Health and Safety and that of any other person who may be affected by your acts or omissions at work To co-operate with University Hospital of North Staffordshire Trust in ensuring that statutory regulations, codes of practice, local policies and departmental health and safety rules are adhered to Confidentiality To ensure that confidentiality is maintained at all times Equality and Diversity To promote equality and diversity in your working life ensuring that all the staff and patients who you work with feel valued and treated in a fair and equitable manner Infection Control Infection Control is everyone s responsibility. All staff, both clinical and non clinical, are required to adhere to the Trusts Infection Prevention and Control Policies and make every effort to maintain high standards of infection control at all times thereby reducing the burden of Healthcare Associated Infections including MRSA. All staff employed by the UHNS Trust have the following key responsibilities: Staff must wash their hands or use alcohol gel on entry and exit from all clinical areas and between each patient contact. Staff members have a duty to attend mandatory infection control training provided for them by the Trust. Staff members who develop recurrent skin and soft tissue infections and other infections that may be transmittable to patients have a duty to contact Occupational Health. JOB DESCRIPTION. To contribute to the formulation, implementation and evaluation of the Nursing and Midwifery Strategy. Job Description. Professionally accountable to the Medical Director with respect to Trust-wide Medicines Optimisation. JOB DESCRIPTION Job Title: Reporting To: Department(s)/Location: Head of Organisational Development & Learning Director of Human Resources Human Resources Directorate, Job Reference number (coded): 1. Job Description. 3. To provide financial support to the Directors in respect of the monthly performance reviews. Applicants must be registered on the psychiatric division of the register of An Bord Altranais. 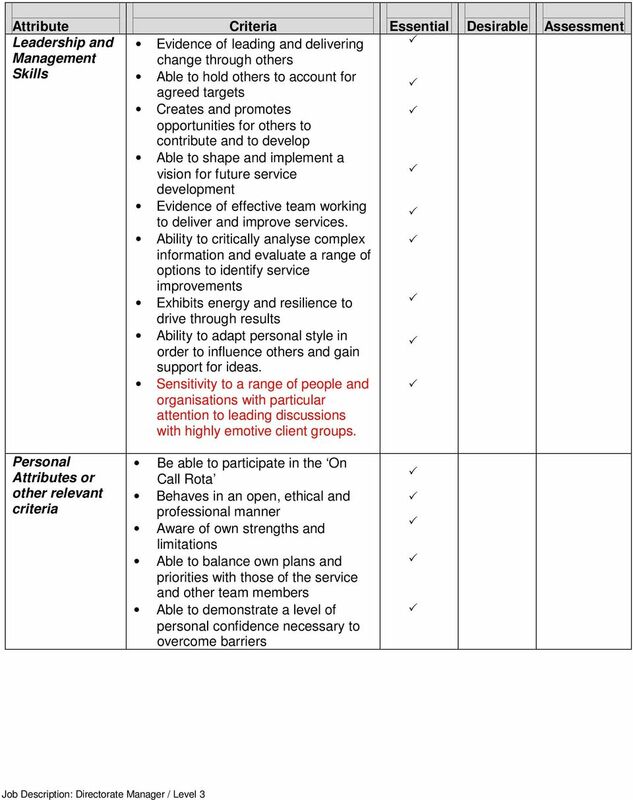 Performance Management and Service Improvement Directorate. 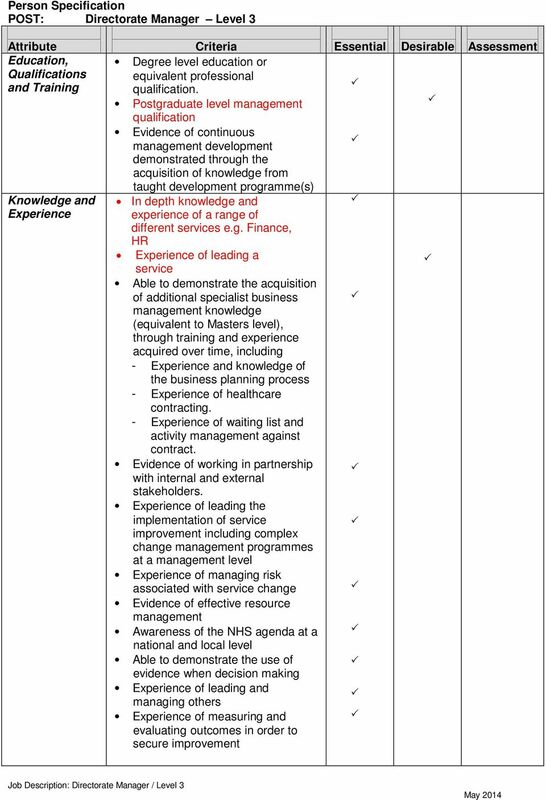 Programme Manager: Unscheduled Care. 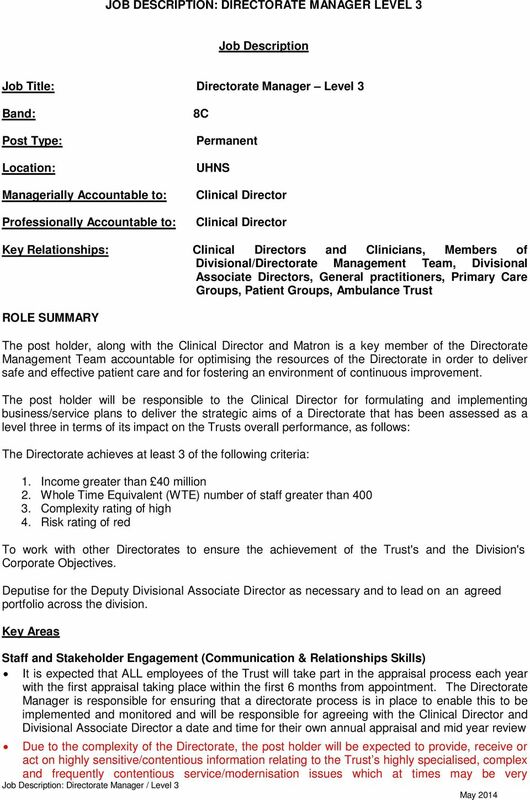 Assistant Director for Unscheduled Care. JOB DESCRIPTION & PERSON SPECIFICATION. Based in Harold s Cross. Advanced Nurse Practitioner (candidate) Indefinite Duration 1.